Holland & Barrett's Big Beauty Swap. I'm sure I've mentioned it before, but I have super sensitive skin. If my skin decides it doesn't like something, it will quickly let me know. In the past I've suffered from psoriasis-like skin patches, which pop up every now and again, which I can only put down to having a reaction to something. Recently I found my body hasn't been enjoying particular shower gels, so I have to be careful what type I use. As well as this my face skin, really doesn't enjoy some products I've used in the past, I once had a crazy reaction to some toner and couldn't wear make up for days. I still suffer from quite dry patches on my skin and only the smallest amount of product that doesn't agree with me, can make my face lovely and red. So when I heard about Holland & Barrett's﻿ Big Beauty Swap, I was super eager to learn more. 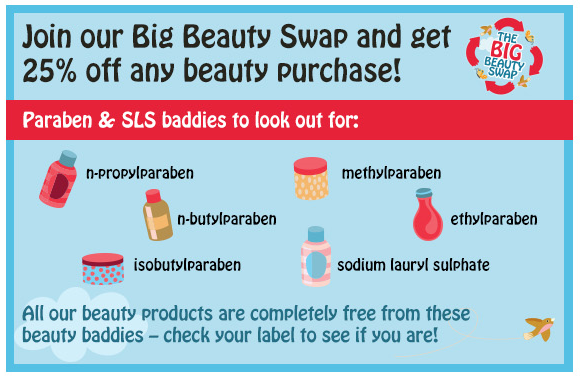 The Big Beauty Swap is taking place until the 11th June on Holland & Barrett's website. 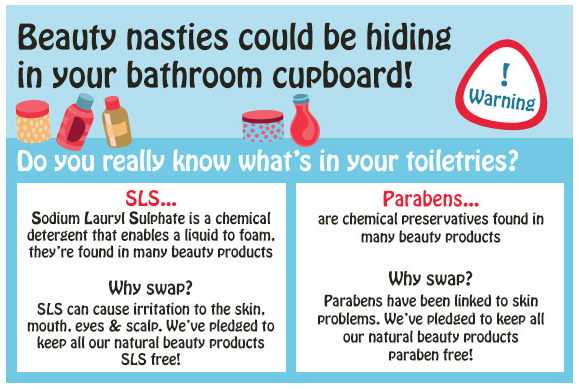 The idea behind the swap is encouraging people to try out beauty products that are free from SLSs and Parabens which are both know to potentially irritate the skin and are linked to some skin problems. Holland & Barrett don't sell any beauty products with either of these chemicals in and would like to encourage people to switch over and try some more natural beauty products. So if you're interested in learning more about the products in the Big Beauty Swap, H&B are offering 25% off natural alternative products on their website here. You can also get involved by taking your empty bottles or used toiletries into Holland & Barrett stores and you'll receive a discount off their beauty range, plus the bottles will be recycled. I can't wait to get involved with the Big Beauty Swap and try out some more natural products. I'm sure my skin will thank me for it. This is such a great idea to get people to try out safer cosmetics :) thank you for sharing! What a great idea! I need to start paying more attention to what goes into my skincare. Great post! Thanks so much for a great post about the health and beauty tips. I'd like to know more about these topics and hope that I can receive more insight into this topic. I'm very impressed by the detail of your blog posts about the New York Healthcare Lawyer. This is going to be very helpful. Thanks for sharing your thoughts. Sometimes it's okay not to be okay. Natural Beauty Picks from Holland & Barrett. Pizza Express at Piccadilly Gardens. What I Got For My Birthday.